Physicists at the National Institute of Standards and Technology (NIST) have built a quantum simulator that can engineer interactions among hundreds of quantum bits (qubits)—10 times more than previous devices. As described in the April 26 issue of Nature*, the simulator has passed a series of important benchmarking tests and scientists are poised to study problems in material science that are impossible to model on conventional computers. Many important problems in physics—especially low-temperature physics—remain poorly understood because the underlying quantum mechanics is vastly complex. Conventional computers—even supercomputers—are inadequate for simulating quantum systems with as few as 30 particles. Better computational tools are needed to understand and rationally design materials, such as high-temperature superconductors, whose properties are believed to depend on the collective quantum behavior of hundreds of particles. The NIST quantum simulator permits study of quantum systems that are difficult to study in the laboratory and impossible to model with a supercomputer. The heart of the simulator is a two-dimensional crystal of beryllium ions (blue spheres in the graphic); the outermost electron of each ion is a quantum bit (qubit, red arrows). The ions are confined by a large magnetic field in a device called a Penning trap (not shown). Inside the trap the crystal rotates clockwise. The NIST simulator consists of a tiny, single-plane crystal of hundreds of beryllium ions, less than 1 millimeter in diameter, hovering inside a device called a Penning trap. The outermost electron of each ion acts as a tiny quantum magnet and is used as a qubit—the quantum equivalent of a "1" or a "0" in a conventional computer. In the benchmarking experiment, physicists used laser beams to cool the ions to near absolute zero. Carefully timed microwave and laser pulses then caused the qubits to interact, mimicking the quantum behavior of materials otherwise very difficult to study in the laboratory. Although the two systems may outwardly appear dissimilar, their behavior is engineered to be mathematically identical. In this way, simulators allow researchers to vary parameters that couldn't be changed in natural solids, such as atomic lattice spacing and geometry. In the NIST benchmarking experiments, the strength of the interactions was intentionally weak so that the simulation remained simple enough to be confirmed by a classical computer. Ongoing research uses much stronger interactions. Simulators exploit a property of quantum mechanics called superposition, wherein a quantum particle is made to be in two distinct states at the same time, for example, aligned and anti-aligned with an external magnetic field. So the number of states simultaneously available to 3 qubits, for example, is 8 and this number grows exponentially with the number of qubits: 2N states for N qubits. Crucially, the NIST simulator also can engineer a second quantum property called entanglement between the qubits, so that even physically well separated particles may be made tightly interconnected. The NIST quantum simulator permits study of quantum systems that are difficult to study in the laboratory and impossible to model with a supercomputer. 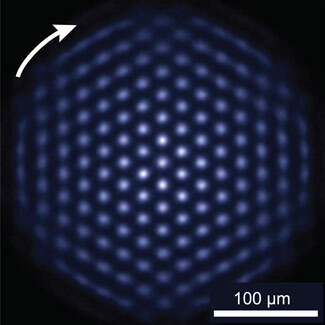 In this photograph of the crystal, the ions are fluorescing, indicating the qubits are all in the same state. Under the right experimental conditions, the ion crystal spontaneously forms this nearly perfect triangular lattice structure. Recent years have seen tremendous interest in quantum simulation; scientists worldwide are striving to build small-scale demonstrations. However, these experiments have yet to fully involve more than 30 quantum particles, the threshold at which calculations become impossible on conventional computers. In contrast, the NIST simulator has extensive control over hundreds of qubits. This order of magnitude increase in qubit-number increases the simulator's quantum state space exponentially. Just writing down on paper a state of a 350-qubit quantum simulator is impossible—it would require more than a googol of digits: 10 to the power of 100. Over the past decade, the same NIST research group has conducted record-setting experiments in quantum computing,** atomic clocks and, now, quantum simulation. In contrast with quantum computers, which are universal devices that someday may solve a wide variety of computational problems, simulators are "special purpose" devices designed to provide insight about specific problems. This work was supported in part by the Defense Advanced Research Projects Agency. Co-authors from Georgetown University, North Carolina State University and in South Africa and Australia contributed to the research. As a nonregulatory agency of the U.S. Department of Commerce, NIST promotes U.S. innovation and industrial competitiveness by advancing measurement science, standards and technology in ways that enhance economic security and improve our quality of life. * J.W. Britton, B.C. Sawyer, A. Keith, C.-C. J. Wang, J.K. Freericks, H. Uys, M. J. Biercuk and J.J. Bollinger. Engineered 2D Ising interactions on a trapped-ion quantum simulator with hundreds of spins. Nature. (In press) doi:10.1038/nature10981. ** See the NIST 2009 news announcement, "NIST Develops Powerful Method of Suppressing Errors in Many Types of Quantum Computers."